The pinnacle of luxury travel, presidential suites are designed to indulge and create an unforgettable experience for those who are accustomed to and demand the very best. The most extravagant space in a hotel they are spacious, often with breathtaking views, spectacular décor and dedicated attendants who anticipate every need and accommodate every whim. 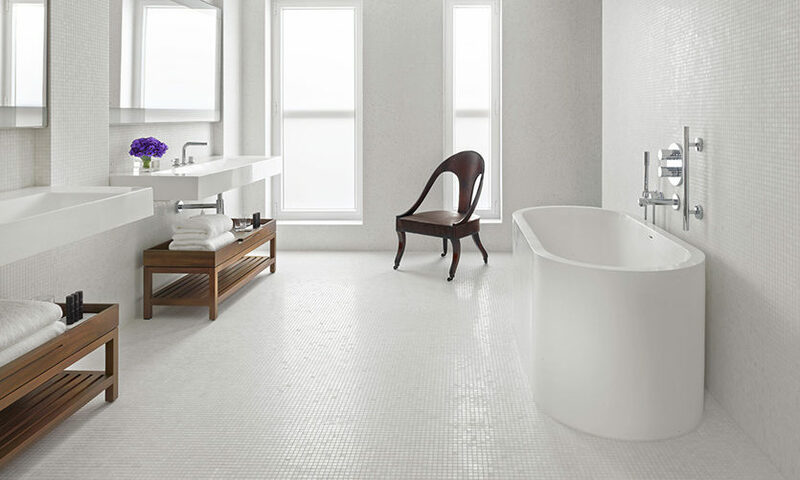 Bathrooms are the pièce de résistance of these extravagant suites. They elevate the guest experience and provide an opportunity to create a space that leaves a lasting impression. Designed to the highest standards and finished with meticulous detail, sumptuous materials such as marble, metal, onyx and timber adorn huge walk in rain showers and generous vanities. More subliminal touches – underfloor heating, ambient lighting and smart solutions which enhance the sensory experience, add additional layers of luxury. Artwork, furniture and statement lighting often feature in these immense, open spaces, blurring the lines between living, sleeping, dressing and bathing. A lavish, sculptural, often fully bespoke freestanding bath, preferably with a view, is the essential ingredient – the epitome of bathroom luxury and an unparalleled bathing experience. Over the years apaiser has been commissioned to create beautiful statement pieces for presidential bathrooms in some of the world’s most luxurious hotels. When designing a bath for a suite, often oversized, organic baths which are simple in form but grand in volume are desirable. Alternatively, highly customised pieces with signature detail, designed exclusively for the project are key. With increasing demand for personalised experiences, individualism and sense of locality, signature touches are vital. For guests who perhaps spend too much time away from their lavish homes, a carefully crafted sense of place and homely ambience are paramount. Sometimes challenging, they are perhaps the most rewarding projects – regardless of style, architecture or location, the finished room is always breathtaking and typically reflective of the hotels’ history, architecture and location – immensely important to the hotel’s narrative. Inspired by breathtaking surroundings and local folklore, two level Panorama Suite encapsulates Swiss style with a refined, contemporary twist. All walls and ceilings are finished in hewed wood, adding a worn, rustic feel. Combined with stylish modern furniture and metal finishes, the space remains cosy while emanating luxurious quality. In this private wellness oasis, an oversized Haven Bath was chosen to be the hero piece for the main bathroom, complementing a hammam and outdoor jacuzzi. The London Edition Hotel is the epitome of luxury which fuses contemporary with art deco and classic styles seamlessly, while paying homage to the history of the building and the iconic Fitzrovia district. 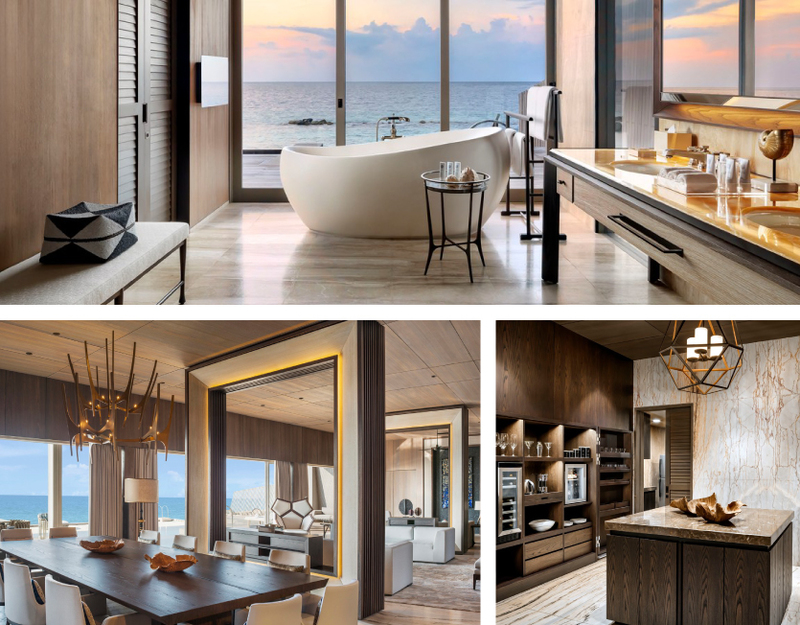 Channeling the interior of a luxury yacht, the eclectic penthouse features floods of natural light, oak and walnut finishes and truly timeless bathware. Originally crafted as bespoke pieces, the baths and vanities later formed inspiration for our Allegra collection. 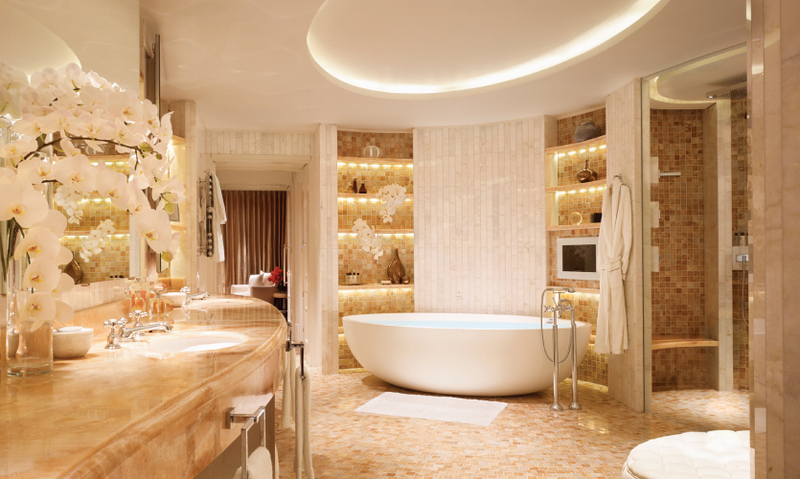 This Presidential Suite at the Mandarin Oriental Hotel proves that an unforgettable bathroom creates a memorable guest experience. The suite combines spaciousness, glamour and a sense of locality with its 270◦ views across Macau Bay. 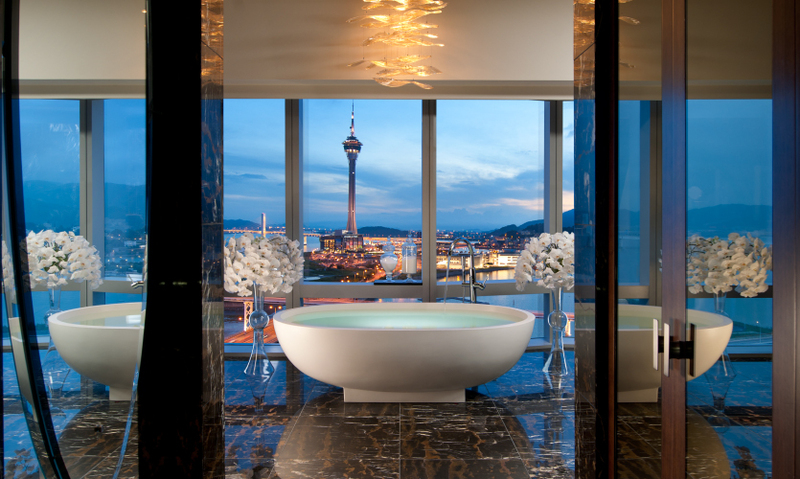 Featuring a custom-made Haven bath standing prominently in the expansive room, it immerses guests in the most stunning view of bustling Macau city skyline. Corinthia’s Royal Penthouse Suite is by far the most expensive room with which we have had the pleasure to work on. Charging on average 45,030 Australian dollars a night for this stunning suite, the hotel offers a 24/7 butler service, personal shopping, fresh flowers and access to the wine collection. The marble bathroom features our fully customized 2.2-metre-long oval bath, providing the ultimate bathing experience. You can see the amazing interiors and our gorgeous bath couture piece in the first episode of BBC1 series ‘Hotel for the Super Rich and Famous’. 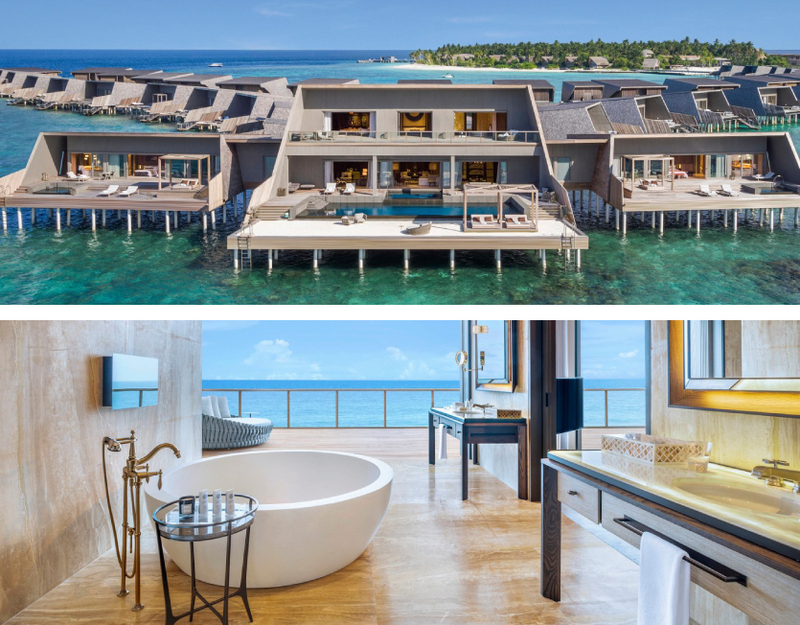 The St Regis Suite is one of the largest overwater villas in the Maldives. Spanning over 1,500 sqm with ocean and beach side views, it offers the ultimate luxury resort living. We supplied Lunar and Immerse (past collections) baths to the marble-finished ensuites. The expansive, airy bathrooms combine minimalism with local aesthetics represented by dark stained side tables and wood paneling.